Comments: A striking whimsical image of vegetables marching around the garden with a women armed with a spade and American Flag flying in the background. This wonderful image comes with the message, "The Seeds of Victory Insure the Fruits of Peace." 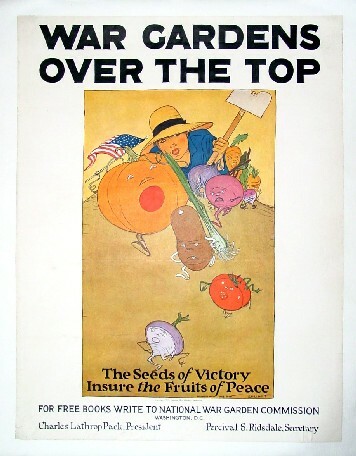 The poster was by children's book illustrator Maginel Wright Enright, sister of architect Frank Lloyd Wright, and was part of the effort to recruit school children to plant war gardens. Size: 22 1/2 x 29 1/2"
Condition: Linen backed, striking colors, nice presentation with some repaired edge tears and some blistering of the paper below the image.